equiped with excellent security measures and ultrafast connections. You have the server, we have the network. Installing your server in a datacenter is easy: Kinamo guides you in the setup process of your server in a class A datacenter in Belgium. Server housing offers many benefits: a reliable environment, guaranteed uptime, fast and redundant Internet backbone connectivity, professional cooling and profound physical security checks. Decrease your operational costs while increasing the quality of your IT infrastructure. Thanks to the central location of our datacenter on the metro fiber network of Brussels we can guarantee redundant and fast connections to all important network operators with maximum uptime and connectivity. 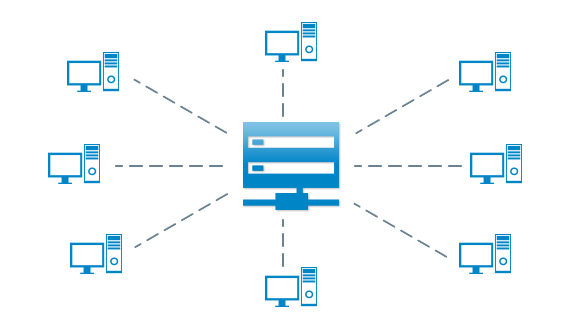 Your server is available through our BGP routing network, set up redundantly of course! You may install servers starting from 1U (1 rack unit height) in our datacenters in Brussels, Belgium. Our server housing solutions go beyond power and connectivity. Extend your infrastructure with help of one of our network specialists. Each server in colocation is connected to the Kinamo gigabit network. You may use two gigabit connections on our switches for a redundant network connection. As official partner and vendor, Kinamo offers you the ability to extend your server housing solution with Dell server hardware, Cisco switching / routers, EMC storage or other solutions. Kinamo delivers a competitive price for additional hardware, the professional guidance comes as standard. Your server is installed in a strict and secure datacenter environment where it has optimum protection against fire and power cuts and hvac units make sure the ambient temperature and moisture is at an optimal level for your equipment. This is a great benefit for the durability of your hardware. The availability of your server is closely monitored by the Kinamo monitoring system. Our support staff is informed directly if a problem occurs. You may request graphs and reports of your network traffic for any given period through the customer website. You would like to know more about our Server Housing services?